This picture was taken on a walk to Ardnave Point in April 2003. I'm not entirely sure where exactly, I think somewhere near Leac Buidhe. 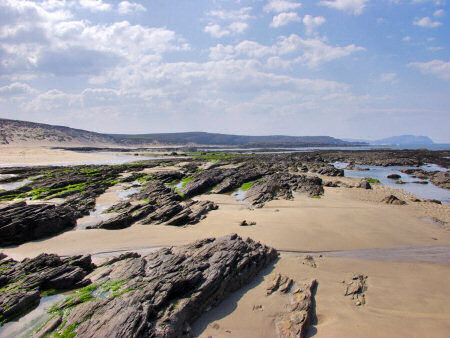 The view goes south west along the dunes towards Sanaigmore Bay (not visible, as behind the hills), the higher cliffs in the distance are Cnoc Uamh nam Fear (128m) and Ton Mhòr (66m). As you can see from the still wet rocks this is at low tide, during high tide this part of the beach would be under water. The walk on the beach along the dunes is very nice, depending on which way you walk getting to this point should take between 30min and 1.5 hours from the car park at Ardnave Loch.